Though Steve Tobia claims that his energetic support for the legally beset Nick Conway is merely a result of an empathy he feels for someone who has had a legal run-in with Caltrans supposedly similar to his own, four quite lengthy columns in a self-generated Los Angeles Times Sunday vanity insert, and all on this exact same topic, does raise some questions. The first one being exactly why is it he cares quite as much as he does? Based on what we have seen from Steve so far, apparently he believes that the arrest and arraignment on four felony charges of Nick Conway, the now former Executive Director of the San Gabriel Valley Council of Governments, is the result of an elaborate conspiracy involving the Mayor Pro Tem of Walnut, the Los Angeles District Attorney's Public Integrity Office, and Caltrans. All of whom colluded to do in Nick Conway, a person Tobia refers to as "a highly regarded private sector consultant." You get the drift here? It's a crooked government conspiracy out to crush a guy for the crime of being from the "private sector." 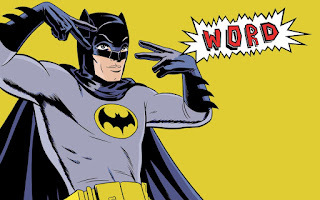 With Steve Tobia starring in the role of Batman. So how does Steve show that this is all the dirty work of a vast network of greedy government co-conspirators? He doesn't really. Rather he spends the better part of three columns talking about his own legal run-in with Caltrans. Which, you will be relieved to know, resulted in a lawsuit and Steve walking away with $2 million dollars in your tax money. Tobia leaves it to you to figure out what the connection might be in these two very different and completely unrelated cases. And for the third time Steve Tobia fails to mention that Nick Conway, rather than merely being an outside "private sector consultant," was actually the Executive Director of the COG, something that made him an ultimate insider in that organization and therefore conceivably responsible for the kinds of things the District Attorney arrested him for. Nick's Executive Director role is an important element in the D.A. 's Conflict of Interest case under Section 1090 of California Government Code. It is also something that inconveniently flies in the face of a defense strategy built on the fiction that Nick was only an innocent hired hand doing what he was ordered to do. A reprise of the old Sargent Schultz dodge, I guess. Obviously Tobia decided it was better to just leave that "Executive Director" thing out altogether. Your paid infomercials in the Los Angeles Times fraudulently allege that I wish to form a new Council of Governments. The San Gabriel Valley Council of Governments is the logical entity to speak as a unified voice for our region. When the criminal allegations are adjudicated against your good "friend" I will evaluate if we rejoin the organization. What happened to your friend is tragic and self-inflicted. He was the architect of his own undoing. I feel sorry for him. Integrity is what we do when no one is looking. Unfortunately for him, people are looking. All of which I thought was a fairly evenhanded response to a guy who had just accused Tom, and in a few heavily distributed opinion pieces no less, of forming a vast conspiracy to somehow take over The COG, one that included both the Los Angeles District Attorney's Public Integrity Office and Caltrans. How exactly so vast an enterprise, made up of such disparate elements, was put together by King has yet to be adequately explained by Mr. Tobia. Apparently that Mayor Pro Tem gig in Walnut comes with some fairly impressive powers. There is one more column to go, however, so maybe this important aspect has been saved for the stunning climax to Tobia's dramatic tale. One more thing. The "paid infomercials" Tom King refers to in his e-mail is Tobia's self-produced mass advertising insert called The Weekly Insider, which is disseminated by the Los Angeles Times each Sunday for its usual distribution fee. The businesses advertising in this throw-away are pretty much the same as those that grace Tobia's THE Magazine, the San Gabriel Valley's own overweening testament to ostentatious consumerism. I wonder how many of these Weekly Insider advertisers understand what exactly they have bought into here. Should they ever figure it out I'm not certain that all of them would be entirely pleased by the association. Has The Tattler Become A Part Of The City's POA Negotiations? As we have noted in the past, if you want to tease out the thinking at City Hall on certain matters, a place you can sometimes go is the Looney Views News. Every once in a while you will be able to find what appears to be a message to one party or another carefully tucked into a feature news article there. Which are always located at the top of the front page, and to the left. A little word to the unwise, as it were. And as opaque as City Hall's machinations can seem at times, and particularly on those issues we're keen to find out more about, this is often one of the few options available. There is a caveat that needs to be explained. "Looney Gazing" is hardly a dependable system. 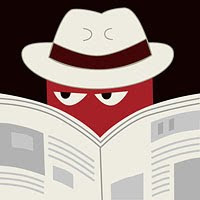 What you are reading there could be something cooked up by the paper's oftentimes creative publisher, designed merely to leave the impression that she has privileged insider knowledge on some big secret or other. There is always that possibility. 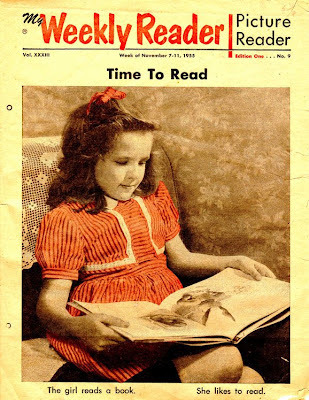 And a lot of dotty old dears, along with Gene Goss, still seem to believe everything they read in that paper. So there is always the "reality creation" angle to consider as well. The article we're rummaging through today appears in the Looney's most recent edition. Entitled "Police Officer Association (sic) Claim Reopens Contracting Debate," it delves into certain issues that we here at The Tattler have been discussing over the past couple of weeks. In particular the influence the SMPOA's recently filed Public Employment Relations Board (PERB) "Complaint" dealing with a vacation pay issue may be having on the ongoing contract (MOU) negotiations with the City of Sierra Madre. The impression many have being that the SMPOA is filing legal complaints against the City while at the same time asking for more money and benefits. One of the things a "Police Officer Association" always depends upon when negotiating for more dough from a city is the support of the people in town. We have all been raised to believe that the Police are a force for good, and as good people ourselves, also our friends. The result being that some folks are horrified by the notion that there might be misguided individuals out there who would even consider replacing the local Police Department with another law enforcement agency. No matter what the ramifications to their taxes, or the City's finances, might be. That approach did work in 2008 when the taxpayers voted to increase their Utility User Tax (UUT) rates to the highest in the state. All so the SMPD could have a raise. 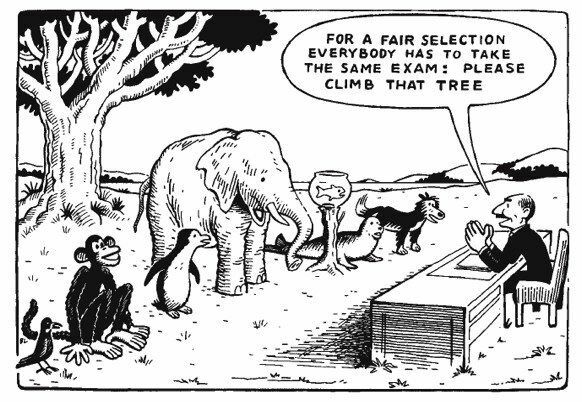 But is this necessarily the case now? Judging by the 60% vote against extending that very same UUT rate increase last April, it would appear that the public's attitude on this matter may have changed. Couple that with the fact that 2 out of the 3 SMPOA endorsed City Council candidates went down to defeat in that same election and you could build a pretty good argument that love is no longer part of the affair. Anyway, here are the two passages of interest from Henderson's "Police Officer Association" article that piqued our interest this morning. The first cite is the lead paragraph. Sierra Madre residents who support the outsourcing of public safety services may look at the recent claim filed by the SM Police Officers Association (POA) for new ammunition. The "may look" observation is a bit obtuse since this has been a burning issue for weeks in this town. With the only news source not discussing it until now being Susan's paper. A very vocal group of Sierra Madre residents may see this latest claim as another reason to contract out public safety services as the cost of defending such actions is an additional strain on the city's budget. Now who, I ask you, is Susan referring to here? That "very vocal group" meme has been used by her before, usually to describe any persons taking the side of an issue that Susan doesn't agree with. With the only "very vocal group" in town these days that I know about being the one that congregates here. Which, if that truly is the case, leaves me feeling cheap and used. Whatever the reasons, it would appear that somebody has been sent a message. The threat being held over their heads? Apparently us. July is the sixth month in row that this blog has attracted over 50,000 hits. In the grand scheme of things those certainly aren't Google or iTunes numbers, but for our little town of less than 11,000 souls it is a significant amount. Add in the 56,000 or so we'll end this month with and we're talking around 330,000 hits in half a year. The new readers we saw going into April's election have decided to stick around, and for that we are very grateful. Car Dealers Against Literacy? (click here): The Greater Los Angeles New Car Dealers Association made a $5,000 contribution to Monrovia Reads, the local non-profit dedicated to 10% literacy in the community. A check for that amount was presented to the organization at their fundraiser on Saturday by Peter Hoffman of Sierra Auto Cars. Some Humarock Residents Discuss Seceding From Scituate In Bonfire Dispute (click here): The anger hasn't subsided in Humarock after 4th of July celebrations were cut short due to safety concerns. The neighborhood met Sunday morning to plan their next move in a quarrel with the Town of Scituate. Nearly 100 people attended a meeting at the South Humarock Civic Association Clubhouse. At the meeting, some residents went so far as to call Scituate town officials "Fascists," and say Humarock needs to break away. The latest aggravation began earlier this month when residents claim the town was heavy-handed in enforcing a ban on beach bonfires. "That was a full military operation, I mean hummers up and down the beach, state police helicopters, horseback, bomb squad, (and) a command post up the center," said Fred Hayden, who owns a summer home in Humarock. California Demon: A state fast becoming America's version of Greece (click here): Call it the European Disease: Run up spending and debt, raise taxes in the name of balancing the budget, then watch as jobs flee, deficits rise, and credit ratings fall. Chief Executive magazine has just come out with a survey of 650 corporate CEOs on the business climate in their states. They ranked local conditions on a range of issues, including regulations, tax policies, work force quality, educational resources, quality of living, and infrastructure. It won't surprise anyone who has followed the annual survey to learn which state finished in the back of the pack, and which finished first. California was dead last in attractiveness to business for the eighth year in a row, while Texas came in first for the eight consecutive time. California parks department finds $54-million surplus (click here): California's parks system stashed away nearly $54 million even as it was cutting services and threatening to close parks, a revelation that prompted the resignation of the department's director Friday. The hoarded cash remained untapped while the California Department of Parks and Recreation painted a dire picture of the system's health, soliciting hundreds of thousands of dollars in donations in what was thought to be a desperate scramble to keep facilities open. The state planned to close 70 parks this month to save $22 million, less than half the amount of the department's hidden surplus. Almost all of the parks were kept open because of partnerships with other agencies, private donors and nonprofit groups. "It disgusts me," said Myra Hilliard, who donated and helped raise money for the Pio Pico State Historic Park in Whittier. "Is anybody honest about anything anymore? Here we are working so hard to keep the park open and they have all this money they aren't telling us about." Hilliard said elementary school students held a bake sale to raise $120 after being told the park might close. The park costs $80,000 a year to keep open. Analysis: State Controller, Department of Finance $2.3 billion apart on special funds (click here): A week after uncovering a hidden-funds scandal at the state parks department, finance officials are now trying to piece together why the balance sheets for similar "special funds" are off by $2.3 billion - money that appeared to be right under their noses amid California's financial meltdown. An analysis by the San Jose Mercury News of California's little-known 500-plus special funds - like the ones that included $54 million in parks money shielded from the Department of Finance - shows tens of millions of dollars in discrepancies in numerous accounts. The fund that gives restitution to violent crime victims was off by $29 million. The one that provides children with low-cost health insurance was $30 million out of balance. The fund that rewards people for recycling bottles and cans was $113 million off. The newspaper's review found at least 17 accounts that appeared to have significantly more reserve cash than what individual departments reported to the finance department, though it's unclear why. The Search for Paul Alva: For many of us Chairman Paul Alva, who is usually just about the only person to talk at Green Committee meetings, is something of a mystery. He is, in case you don't know, the guy who wants to make Sierra Madre "just a little bit greener." Unfortunately, he has bought into the Sacramento fallacy that you can do so by building high-density mixed-use SCAG Housing downtown. Constructing condos, and lots of them, somehow being the way to stop global warming. An idea that is, of course, nuts. So we've launched a "Where's Waldo" style internet search in hopes of finding Paul in his native habitat. Here is one of the document that has turned up so far (click here). 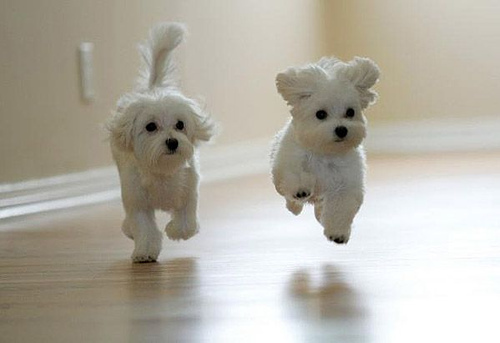 If you find any others be sure to send them our way. Enjoy what is expected to be a beautiful Sunday. There was some concern expressed here by those commenting yesterday that the timeline established by City Hall for the City Council's discussion about our continued role in "The COG" was somewhat suspect. Our COG dues, due in June, have yet to be paid. Per the rules of the SGVCOG, should we have not paid our dues by the end of September, our membership would then automatically be void. Which means the Council's discussion on this matter, not agendized to take place until October 9th, would be moot. Technically we would already be out. Of course, the likelihood of The COG throwing anyone out right now is pretty slim. Rather they are trying very hard to keep cities from leaving. With Walnut already gone, and places like San Dimas, Claremont and El Monte (among others) looking like they may very well follow, it really isn't a good time for The COG to be enforcing any dues policies. I would hope that City Hall would not pay that $8,000 we supposedly owe The COG until at least the October 9th City Council discussion has taken place. Paying tribute money to an organization that recently saw its Executive Director rung up by the District Attorney on four felony counts of conflict of interest, with the centerpiece of those charges being the abuse other peoples' money, would seem foolish right now. Sierra Madre needs to at least have a conversation first. And if it takes until October 9 to do it, then the SGVCOG is just going to have to wait for its money. The COG is, of course, in a state of panic right now. Faced with the possibility that they could lose a significant portion of their member cities within the next six months, along with the strong chance that the District Attorney's investigation will not stop with just Nick Conway, has led to a state of advanced uneasiness there. Plus there is also the distinct possibility that should it be established in Court that significant levels of fraud have taken place there, member cities could be forced to return any of the money they had received from "The COG." A hit potentially in the hundreds of thousands of dollars, and something that places like Sierra Madre can ill afford right now. As you might have guessed, I think we need to get out. If the City of Sierra Madre will not take a stand against corruption this grotesque now, then when will we? How bad does the rot have to get for us to actually do something? As you know these have been difficult times for the COG and member agencies perception of this organization. Several cities are contemplating withholding dues and/or withdrawing membership. Although I can understand the concern and even consternation, I am reminded of the old analogy of "throwing out the baby with the bathwater." No single individual, or Governing Board Member, should be cause to disband or kill the organization. The COG as an organization was born out the necessity (sic) of the cities, County, and water agencies to work together on issues of regional concern. The cities know all to well that alone our voices are less than significant in dealing with the MTA, State, or Federal Government. Together we have made a significant difference in accomplishing great things for this Valley we call home. This being the kind of damage control that Delach would be expected to do under the circumstances. Having COG's Executive Director, someone who ran they place with an iron fist for years, arrested and arraigned on felony corruption charges by the County of Los Angeles, will do that. It is about as bad as things can get for an organization like The COG. So what exactly are these COG contributions that Delach refers to as "great things for this Valley we call home?" They are listed in this SGVCOG document as proof of the need for its continued existence. Unfortunately, they appear more like regional disasters than anything else. I've pulled a few out of the roster so you can see what I mean. RHNA: The Regional Housing Needs Assessment (RHNA) is completed by the Southern California Association of Governments (SCAG) every eight years to determine the number of low - and moderate - income housing units that should be developed in each city to meet the region's needs. "RHNA numbers," as they often called, are perhaps the most despised aspect of regional government here in the so-called "SCAG Region." That "The COG" plays a key role in enforcing what are basically state mandated, Sacramento lobbyist initiated demands that our local cities accept "SCAG Housing" that they most decidedly do not want hardly speaks to a need for COG's survival. That the SGVCOG claims that it plays an important role in the RHNA appeals process is also a sham. Out of all the COG cities that appealed their RHNA numbers this cycle, only one, La Puente, saw its number reduced. And then only by a very few housing units. 710 Gap Closure Environmental Work: This year, work began on the 710 Gap Closure environmental impact report. This Measure R funded effort represents significant project (sic) on a long-standing SGVCOG transportation priority. By "710 Gap Closure" he is talking about building the 710 Tunnel. Something that Fran Deloch can't even force himself to say. Rather we get an Orwellian euphemism. This tunnel will be an environmental disaster for our part of the planet, effectively funneling vast quantities of diesel burning truck traffic from the Ports of Los Angeles and Long Beach, up the 710 and right into our backyard. The "710 Corridor" is widely recognized as one of the truly significant air pollution disasters of Los Angeles County. "The COG" wants to extend that by bringing it here. Measure R Funding: This year, 710 Gap Closure, ACE and the Gold Line Foothill Extension saw the first draw down of Measure R funding. Measure R, as I am certain you know, is a sales tax increase voted into existence a couple of years back. It is up for a voter renewal through 2069 this November. And what are we getting in exchange? Thanks to the hard work of "The COG," the 710 Tunnel plus a "Gold Line Foothill Extension." The problem being that any extension of the Gold Line has been taken off the table by Metro, who would now prefer to spend our tax money on things like the Los Angeles "Subway to the Sea." The COG wants you to cast a "yes" vote on Measure R. Why? So they can build a 710 truck tunnel that will send cancer rates in our area skyrocketing, while at the same time not finishing the Gold Line? The SGVCOG simply has got to go. There is a very interesting document to be found on the City of Sierra Madre website. Entitled the City Manager's Report, this weekly accounting of all things bright and beautiful used to be for the viewing pleasure of elected officials and key City Staff only. But because all such documents are now required to be made available on-line to snoops such as you and me, it is now available to all. Should you wish to go right to it you may do so by clicking here. As we all know, the premiere entertainment event offered by City Hall is the City Council meeting. You have your Planning Commission meeting, your General Plan Update Steering Committee meeting, or even the most otherworldly of all, your Green Committee meeting. But none comes close in drama or raw emotional impact as when the City Council gets together and discusses those topics so vital to the interests of our endangered species of a town. Think of it as C-Span meets Rob Dyrdek's Ridiculousness. And, interestingly enough, within the heretofore difficult to obtain (not that finding anything on the City's website is much easier) City Manager's Report, is a list of every single topic up for City Council discussion over the next few months. Stacked up like passenger jets hoping to someday land at LAX, these babies patiently await their moment of glory. With some, in my opinion, being forced to wait too long. And maybe you'll agree. Like the COG discussion that Councilmember Harabedian proposed at Tuesday's confab. That shouldn't have to wait until October 9 in my opinion. Our legal and potentially devastating financial exposure would seem to preclude its being shoved to the back of the bus like that. But that is just my opinion. And like dinners with in-laws, everybody has got some. So as a public service (and a truly prodigious exercise in typing), here are all of the topics scheduled for City Council exposure between now and the second Tuesday of October. See if you can't find your favorites. I did, and those are here in red. So there you go. So much to look forward to, I'd say. 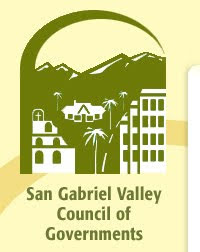 Slowly the member cities of the San Gabriel Valley Council of Governments ("COG") are beginning to take a hard look at their reasons for belonging to this vastly troubled organization. And, what would have seemed unthinkable a year ago, some are giving serious consideration to getting out entirely. San Dimas considers pulling out of COG, but withholds $15,000 in dues instead - The City Council nearly withdrew from the scandal-plagued San Gabriel Valley Council of Governments on Tuesday, but instead voted to withhold its dues from the organization until the matter could be studied further. On Tuesday, the council seemed nearly ready to withdraw from the COG, with Mayor Curt Morris saying it "is built on a conflict of interest." Morris said the COG's administration has not followed through on its promises to make the organization more transparent. "I think the only answer we can do to get their attention is to withdraw," Morris said. In the end San Dimas's COG representative and Nick Conway grasshopper Denis Bertone bought some time by convincing his fellow Councilmembers to initiate a study before pulling out, but you can see where this is going. Three of the five members of the San Dimas City Council are now down on record as supporting getting out of the SGVCOG, so this could only be a matter of time. The City of Walnut has already dumped this organization, with Claremont and El Monte scheduled to give this matter a hard look in the not too distant future. And here in Sierra Madre Councilmember John Harabedian agendized an examination of our continued relationship with the SGVCOG at Tuesday evening's City Council meeting. Hopefully this matter will come up for discussion soon. It should be a pretty interesting conversation. SGVCOG's Conway pleads not guilty to conflict of interest charges - Nick Conway, executive director of the San Gabriel Valley Council of Governments, pleaded not guilty Monday to four felony charges of conflict of interest relating to his work with the regional government agency. Conway has been the subject of an investigation by the Public Integrity Division of the Los Angeles County District Attorney's Office for several months, said Dave Demerjian, head of the division that investigates public corruption. The investigation came after the District Attorney received at least two complaints about Conway. The D.A. 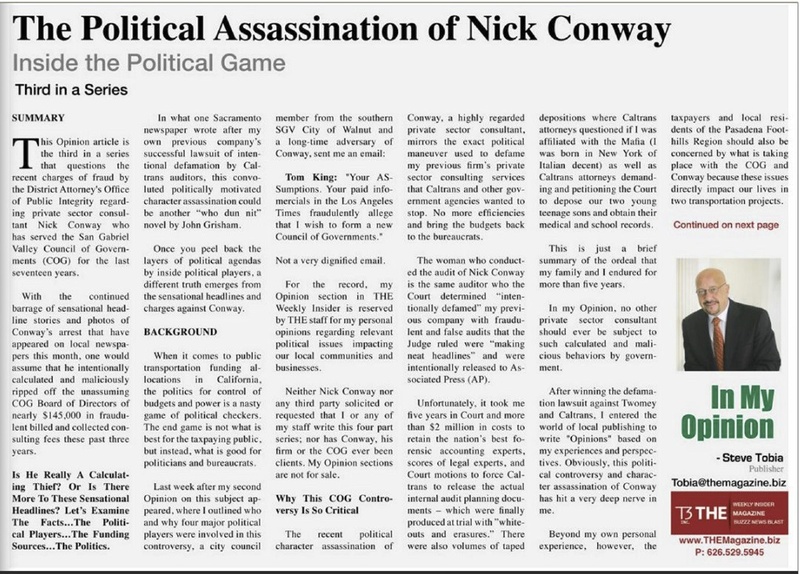 alleges Conway's personal business, Arroyo Associates, Inc. - which is contracted by the COG to serve as its staff - gained financially from contracts and grants obtained for the COG, amounting to a conflict of interest. By obtaining and managing the extra state and county grants, the DA's office alleges Conway's company received an additional $143,000 in one fiscal period. Conway's attorney, Ken White of Brown, White and Newhouse of Los Angeles, refuted the allegations. "The bottom line is, there is not a single thing he is being charged with that is not part of the public record or has not been approved by the (SGVCOG) board," White said. Can it be that Nick Conway is planning on throwing his good friends on the COG's Governing Board under the bus in order to save his own skin from a trip to prison? Stay tuned. I promise you that The Tattler will be watching this move closely. San Gabriel Valley officials vote to support Measure R extension - For the first time in four years, the county's 40 billion sales tax measure for new transit projects is getting some love from San Gabriel Valley officials. After opposing the ballot measure in 2008, the San Gabriel Valley Council of Governments voted 19 - 4 last week to endorse a new Measure R, which extends the life of the existing half-cent transit sales tax for another 30 years and promises to jump-start 12 rail and subway projects by borrowing against future Measure R tax revenues. There is a problem here, however. I mean a problem beyond the request that you vote to keep the Measure R sales tax increase in place until the year 2069. Which is way beyond the freshness dating of most of us. A gift for the grandkids, I suppose. The SGVCOG's blessing came after months of heated debate and some foothill members say, at the expense of the Gold Line Foothill's next phase to Claremont, which was left out of the new Measure R's expenditure plan. By not including any funding, the second half of the (Gold) line through Glendora, San Dimas, La Verne, Pomona and Claremont possibly Montclair in San Bernardino County is in jeopardy. Which is kind of astonishing if you think about it. The Gold Line will apparently end nearly forever where it does now, with the money from an ongoing Measure R being used instead to build public transportation on the westside of Los Angeles County. And a supposed San Gabriel Valley regional government organization, which we pay $8,000 or so a year to represent our interests, voted to go along with a sales tax extension that would do just that. "Man oh man, I need a break. Think I'll go microwave my toothpaste." - Comment left here last night at 10:43 pm. I hate it when things go so well. I got pretty much everything I wanted at the City Council meeting last night, and I swear I have never been so unhappy. And they were all so agreeable while doing it. If things keep up like this I can just as well give up the blog and go back to doing crossword puzzles. Which was how I used to spend my time before I started doing this. There is also this frightening thought. What if The Tattler actually has become influential, and what gets written here actually has some influence at City Council meetings? What the h--- am I going to do then? After a lifetime of being against almost everything, suddenly I have to face the indignity of being a part of the solution? Has it all come to this? If so, it could call for a personal reinvention. And then there is this question. Does cheerful news make for good blog content? OK, now that I have shared some of my deepest and darkest thoughts, let's see if I can remember what actually went on last night. There are already 609 hits on this site since the City Council meeting began, and it is now 11:45 pm. The pressure is on. And please, don't get me wrong, it wasn't all nice. The first thing I'd like to note here is just about the last thing that happened at this meeting. John Harabedian asked to agendize a City Council conversation regarding the SGVCOG and Sierra Madre's role as a part of it. I have no idea where he is going with this, but a number of COG member cities are doing something like it, with the City of Walnut having actually already gotten out. As evidenced by former COG Executive Director Nick Conway going on trial for various corruption related activities, there seems to be the beginning of a reform movement taking place in the San Gabriel Valley. And there is no place on Earth that needs one more. Colin Braudrick returned to the limelight of City Hall last night with a lot of very good news about the Library. Good to see him back in the world. His absence had been noted. Colin was wearing the coolest Pabst Blue Ribbon tee shirt I've seen in a while. Old school American beer is making a comeback, and Pabst is leading the way. It even comes in cans. Next time you're down at Robin's Ribs you owe it to yourself to order some. Lighter than air, and when served ice cold, far more refreshing. All things come full circle eventually. Even beer. In one of the most elegantly delivered smack downs I have seen in a while, the Chairman of the Senior Commission, Bill Nelson, laid one on Nancy Walsh that would have knocked out Joe Frasier. After discussing the various increased costs to seniors for such things as City sponsored lunches and trips on the round about, Bill noted that he did not discover that prices per ride had gone up on our local town jitney until he experienced it himself on July 13. Turns out the rate increase had begun on July 1st. Why hadn't the Chairman of the Senior Commission been notified by Nancy Walsh? Can it really be she didn't inform the people she so famously claims to represent? There was some conversation about the upcoming League of California Cities confab in San Diego, which is going down September 5th through the 7th. Registration fees are a cool $625 per happy camper attending, with room rates at the San Diego Marriott Marquis and Marina running about $400 for two nights. That's before taxes, mini bar, in-room entertainment and meals, of course. Chris Koerber was pressing for the actual expenses involved in this visitation, and the always charmless Josh, bless his testy heart, actually used the word "inappropriate" to describe his concern. Which I found to be inappropriate since we're talking about the peoples' cash here. A lot of the sensitivity over the League's big yearly event stems from the grotesque sums of money our merry junketeers spent in San Francisco last year. It does seem like a lot of money to squander on an organization that is doing everything it can to strip cities such as ours of their last vestiges of independence. Particularly in these economically parlous times. The two vacancies on the Planning Commission were filled. Earlier I said that I had gotten everything I wanted out of this meeting, but that isn't entirely true. I was really pulling for De Alcorn to get a shot. There are not many people who have worked harder for this City than De. However, in Manish Desai and Ken Goldstein the people of Sierra Madre got two moderate and thoughtful souls that appear to understand what it is the people of this town want. Which, in case you don't know, is for Sierra Madre to stay Sierra Madre. And while Ken wasn't there to speak last night (he did show up later), you might recall the chat he delivered when he was looking to get on the Library Board. A job that went instead to Gene Goss. It appears that fate saved him for something more important. Next up was the delightfully entitled "Municipal Code Regarding Public Nuisances, Code Enforcement Fees, And Attorney's Fees." Who says there is no poetry in our City Hall? Long story short, the City Council gave its in initial approval to something that will eventually lead to the City having yet another way to chase revenue. In this case reclaiming the costs of enforcing City Codes, along with the costs of paying lawyers to do the dirty work. Despite all the earnest chatter from the City Council, I still see a distinct downside to this one. The main event of last night was establishing the ballot language for this November's vote on the Kensington. And something happened that would have seemed unbelievable just a few months earlier, and that is this vote will be conducted under the full auspices of Measure V. Rather than spend the rest of the night going through all the details, I thought I would post the statement I received late last night from Councilmember Chris Koerber. After an exhaustive review of the Kensington proposal - nine Planning Commission meetings and three City Council meetings - I am pleased that the city is moving forward with the November vote to approve what will undoubtedly be an asset to the Sierra Madre community. While the proposed Kensington project is not a perfect project, it is nonetheless a very good project. I am particularly pleased that the project maintains the spirit of Measure V. Allowing citizens to vote on such an important project helps to ensure the community has a say in major city changes - especially those located in the Downtown Central Core. I'm especially pleased that private funds are being used for the Kensington - this avoiding further burdens on Sierra Madre's budget. I thank the applicant, Fountain Square Development West, for their cooperation with the city and, also, for their request to put the project up for a Measure V vote. 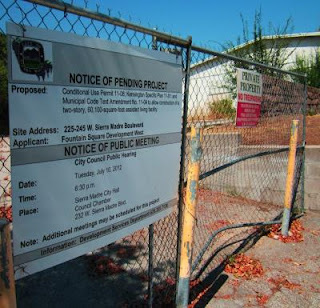 I look forward to construction of this important project moving forward (pending the results of the November 6, 2012 vote), both for the important services it will bring to our community and also for the revenue it will generate for Sierra Madre as well. There is one more thing. During the discussion about how the Kensington ballot language should read, there was some concern over the usage of the term "consistent with." As I noted yesterday, the fear being that this usage could later be misappropriated (so to speak) for ulterior purposes later on. Councilmember Harabedian asked why the term "specified by" couldn't take its place. The City Attorney explained the reasons for her phrasing of the question, and after some conversation her version prevailed. Part of the problem is by law such ballot questions must be limited to 75 words, and under that restriction what we got is the best available. It is good to see that this matter was fully aired out. All in all a pretty good night. But like I said, this is going to take some getting used to. In his July 2nd letter to the City Council, the Kensington Assisted Living Facility developer Billy Shields insisted that his project be put to the voters in the form of a true Measure V ballot. His attorneys had correctly concluded that Measure V is indeed the law in Sierra Madre, and to do otherwise would be to put his project at considerable future legal risk. If you are investing this large an amount of money in a project, the point of joining some local politician's crap shoot designed to get around a local development ordinance that he holds a grudge against becomes moot. It just isn't smart business. The rich irony here is that Shields, both partner and spokesperson for a business group that comes from somewhere down around San Diego, felt compelled to request that the City Council of Sierra Madre follow its own law. Something that you'd have thought would be automatic, but the recently completed and highly contentious review of the project by the Planning Commission clearly indicated otherwise. It seemed obvious to many here that the City Attorney's Office was determined to raise doubts about the applicability of Measure V to the Kensington project, and in an exceedingly painful process lasting months pounded the Planning Commission with an entire series of baseless and at times absurd canards designed to achieve just that purpose. All of which came to nothing when Billy Shields sent his letter into the City Council. The inference contained there being that while they might consider not following their own law on this matter, he was not willing to be anybody's crash test dummy in this case. And in one of the more remarkable evenings ever seen in Council Chambers, the City Council abandoned the months long efforts of its own City Attorney and gave Billy, along with Measure V's many passionate supporters, the victory they wanted. And they did it by merely following the law. For whatever the reasons, acceding to the law that evening was seen by many as being quite a surprise. Including the many people attending that meeting. That the Mayor of Sierra Madre actually had to explain that he was going to follow the law in this matter being a good indication of just how poorly the process had been conducted up until that point. In his letter Billy Shields specifically spells out how he believes the ballot language for the Kensington/Measure V vote should read. Again, why he felt the need to do so does invite speculation. I have discussed the language Shields provided in his letter with a couple of attorneys who know far more than I on the topic, and both agreed that it is the very best possible for this purpose. Certainly it is what a businessman interested in protecting his investment from any future legal challenges would insist on. The Sierra Madre Voters Empowerment Ordinance (also known as Measure V) is hereby amended with regard to two parcels only, located at 33 North Hermosa Avenue (APN 5768-019-043) and 245 West Sierra Madre Boulevard (APN 5768-019-041), to allow the development of the assisted living facility, as described in The Kensington (Assisted Living Facility) Specific Plan, dated ______, 2012, on file with the City of Sierra Madre, not to exceed two (2) stories, not to exceed 30 feet in height, and not to exceed 75 assisted living suites, comprising 60,100 square feet of space, at the 1.84 acre site. If you go to the Agenda Report provided by City Staff for this evening's City Council meeting, you will see that the ballot language being proposed there is somewhat less specific. Shall an Ordinance be adopted to amend Sierra Madre Municipal Code Section 17.25.040 ("Core Density Limit") of the People's Empowerment Act (aka Measure V) to permit development of an assisted living facility consistent with the Kensington Assisted Living Facility Specific Plan and not exceeding two stories, thirty feet in height and seventy-five assisted living suites, for the parcels located at 33 North Hermosa Avenue and 245 West Sierra Madre Boulevard? Now forgive me if I seem somewhat overly skeptical here, but why is it the City's ballot language is far less detailed than that provided by Mr. Shields and his lawyers? As an example, while Shields provides the exact APN numbers of the plots involved, the version prepared by the City only provides an address. I think it is important to be very exact about these matters because we would hardly want to inadvertently provide such an exemption to the entire downtown area. And what is up with this rhythm? "... permit the development of an assisted living facility consistent with the Kensington Assisted Living Facility Specific Plan." Will we be voting on the Kensington Assisted Living Facility specifically, or simply the style of architecture and business plan contained within it? Are we approving the building of this one structure only, or empowering someone in the future to determine if other projects might also be "consistent" with this particular, and as yet unapproved, specific plan? I think this all needs to be scrutinized very closely. And we then need to go with Billy's language. The Return of Ron Brandley? If they ever get to it this evening the matter of filling the two now empty seats on the Planning Commission will be considered. There are some very qualified candidates, some candidates who are new to the town, and one that doesn't even live here. Which I guess is OK when you consider that our current Mayor was a resident of Monrovia right up until the time he filed his papers to run for office in Sierra Madre. Brandley Resigns From Sierra Madre Plannig Commission (click here): Planning Commissioner Ron Brandley has tendered his resignation to the City Council. Brandley, who has been on the Planning Commission since 1999, stepped down after choosing not to respond to questions from the City Attorney regarding the possibility of a conflict of interest, questions raised by an anonymous phone caller in a voice mail message left for a member of City Staff. Brandley's term was to end in June, 2007. This rather selective article took the point of view that Ron's resignation was a matter of principle for him. Brandley feeling that a conflict of interest investigation should hardly be predicated upon an anonymous message left on an answering machine. The obvious spin being ladled up here aside, the City Attorney disagreed. When asked if it was ordinary for the City Attorney to investigate based on an anonymous call, Levin responded, "Oh absolutely, whenever there is a question about a conflict of interest, then the City is obligated to follow up and find out if there was a conflict of interest." The accounting we have received here at The Tattler shows that these concerns were not without merit. The contention being that Brandley did not recuse himself when required to do so by the Brown Act, and on numerous occasions. Brandley's family owns a business at 9 Kersting Court and, when matters came up at the Planning Commission that were within 500 feet of his place, he still chose to participate. Including ten meetings over 5 year period (Feb of 1999 to Nov of 2004) regarding the Montecito Specific Plan. Again, a violation of the Brown Act. There is much more. Did you know that Ron voted on the Commercial Overlay Zone, which included where his business was set up? A little blast from the past here. Let's hope it stays there. The guy who usually writes up the Sierra Madre City Council meeting preview reports for this blog ran from his house screaming something completely unintelligible about 48 hours ago. We figure he'll eventually get hungry and return home, but it is no big loss if he doesn't. We'd call the Search and Rescue guys, but then it would invariably end up as one of the thousands of "hiker lost in the mountains" stories you see on Patch. And I am not sure anybody here has the strength to endure much of that anymore. I certainly know that I would find it to be difficult. So instead this week's City Council preview article will be written by a pair of pants. 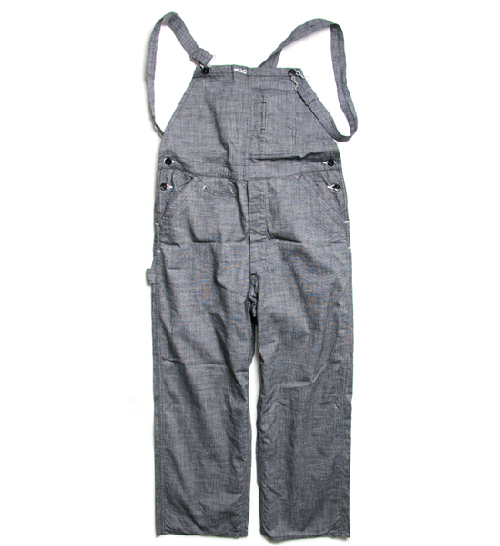 Overalls to be exact. And while I am not certain these pants will be able to do as good a job as that other guy, I am also not sure anyone will notice. These things are all basically guess work as it is. Who really knows how these meetings will turn out? This is a kind of a test, however. We're not going to turn the entire meeting preview over to a pair of pants. These matters are far too important for that. No, we're going to let him do the first part, at least through the end of the Consent Calendar. Tomorrow we'll tackle the much bigger subject of the Kensington/Measure V imbroglio. I don't think that one is over by any stretch of the imagination, despite what you might have heard. It deserves an entire post all to itself. So without any further ado, take it away, Agenda Pants. This meeting, like most others, opens with a "closed session" because various police officers, along with the Sierra Madre Police Officer's Association, are either suing the taxpayers, or threatening to sue them. This is what they usually do when they aren't asking us for higher salaries, benefits and money for their retirement. You really do have to be concerned about their sanity. Once that little bit of work is complete the doors will open and the pilgrims allowed into Council Chambers to witness another bi-weekly session of the City's business. Mayor Josh Moran will lead the assembled in the Pledge of Allegiance, and then deliver either an invocation or an inspiration. This is where the Mayor either chooses to invoke God, or give the room a Babbitt-like pep talk. I believe it will have to be the latter by necessity. As many are aware, God no longer wishes to go into City Hall. And since He is the Almighty, that choice is His. Josh has no other option left but to try and cheer people up. Next in view is the Consent Calendar, and this week there are 5 topics, each distinguished by its very own letter designation. All in the lower case. Letter "a" is naturally first, and that is because spending money is always the priority at City Hall. This week the lordly sum of $584,447.60 will disappear as if by magic. For each and every one of the myriad items both large and small that make up a city government there must be a corresponding check in the mail. Combine this meeting's portion with the other July spends of two weeks ago and you'll see that the City of Sierra Madre will have consumed $1,040,838 in 4 weeks. It is quite a feat. The Consent Calendar item labeled "b" has to do with the paperwork involved in the hiring of three new Fire Captains. And there is always paperwork involved, and with legal terms to be defined as well. A bit of an optimistic move by the City if you think about it. Despite all the claims being made last April that a "no" vote on the UUT Measures would impoverish this little old town to the point of insolvency, it appears City Hall still has the ability to hire some folks to new positions. And if they are going to hire people for anything, it might as well be the Fire Department. There certainly is no better use for our tax money. The next item is letter "c" (do you detect a pattern here?) and it has to do with rules for those submitting programming to SMTV3 for broadcast. Properly entitled "Channel Guidelines for Submissions," it details all of the exciting things you'll need to do to get your show before the dozens of rapt and loyal viewers of Sierra Madre's official government television station. Unfortunately, so far only one such show has been submitted. There is also a lament here from City Staff that they somehow forgot to include the fee costs for submitting a show to SMTV3 on the City's official fee schedule. Which does bring up a sore point with me. How is it that we pay for such things as SMTV3 with our taxes, yet we'll be required to pay a second time in the form of fees should we actually want to make some use of it? That seems like double-dipping to me. One more thing on Item "c," basically because now I am getting annoyed. There is an item in the guidelines that states the following about any submitted programming: "Must be non-partisan, non-political, non-commercial, and of community wide interest." How does that jibe with the Bill of Rights? And if you take all of those things out, what exactly is left? A TV show dedicated to the topic of watching grass grow? Consent Calendar letter "d" has to do with the disposal of dangerous waste. The County of Los Angeles will be dispatching DPW guys in hazmat suits to Sierra Madre to pick up such life threatening items as brake fluid, paint and paint thinner, pesticides, old batteries, unconsumed drugs, anti-freeze, annoying relatives and more stuff like it. You cannot bring explosives, ammunition or radioactive waste to this event, however. Those items you either drive out to the desert and throw from your car window, or use for taking out stop signs and the mailboxes of those with whom you have political differences. The City Council's job here is to decide where these fellows will set up shop to do their vital disposal work, and then TUP 'em. Last year they operated out of the parking lot somewhere behind The Bucchaneer. I went there and had an absurd experience. I pulled up to the guys in the hazmat suits and started to get out to unload all the stuff I'd stashed in my car trunk. But they wouldn't let me out of my car because it was "too dangerous." It didn't seem to occur to them that I myself had put that stuff in my trunk just an hour earlier, or that it had been sitting in my garage for the past few years. The item designated as lower case letter "e" is with us for the purpose of selecting a full representative and an alternate as voting delegates at the Annual Conference of the League of California Cities, which is to be held in San Diego this year. Our liaison to this awful organization is Josh Moran, with the alternative being John Harabedian. So this Consent Calendar item is pretty much a formality, and deals with giving legal voting authority to the Mayor while at this conference. Of course, if I was King I'd get our city out of this parcel of pottage. The only difference between "The League" and organizations like the California Association of Realtors or the Building Industry Association is that LoCC members don't believe that they should have to pay for their own drinks. That is what lobbyists are there for. One last topic before we break for the day, and that is Item #2, which has what is certainly the most inadvertently humorous title of any recent City Council meeting agenda. A document not ordinarily noted for its humor, intentional or otherwise. Public Hearing - Consideration Of Ordinance No. 1330 Adopting Chapter 1.14 Of The Municipal Code Regarding Public Nuisances, Code Enforcement Fees, And Attorneys Fees. For once the agenda writer got it right, they really are all public nuisances. What this one is actually all about, however, is recovering the costs of enforcing City Codes, along with the legal expenses to the City that might be incurred. Should this new ordinance be approved the party that would have to pick up the costs involved in resolving such violation(s) would be the offending property owner rather than the City. Which I guess would make sense, except for this one thing. Would the City begin to see this as another profit center, like traffic tickets? The one thing that holds City Hall back from overzealous Code enforcement today is, in my opinion, the expenses involved. It has to be a pretty serious deal before they'll lower the boom on some poor sap. But with the sap having to pick up all the expenses involved in the correction of his crime and exacting of his punishment, what is to prevent the City from launching a Code Enforcement Jihad? Particularly since they always seem to need more cash? Extra: We have received word here at The Tattler that Bill Coburn, the longtime spokesperson for the Chamber of Commerce, will be leaving that organization at the end of this month. The reason is a financial one, the Chamber is suffering hardships and is having to make adjustments that reflect that condition. More on this story as it arrives. 21 burned in walk over hot coals at Robbins event (click here): Fire officials said 21 people at an event hosted by motivational speaker Tony Robinson suffered burns while walking across hot coals and three of the injured were treated at hospitals. The injuries took place during the first Thursday of a four-day event at the San Jose Convention Center, hosted by Robbins called "Unleash the Power Within." Most of those hurt had second and third degree burns, said San Jose Fire Department Capt. Reggie Williams. "I just heard these screams of agony," he told the Associated Press. "People were in pain. It sounded like people were being tortured." His informercials have continuously aired on average every 30 minutes, 24 hours a day somewhere in North America since their initial introduction in April 1989, the website says. The Eyes Have It: Marketers Now Track Shoppers' Retinas (click here): Consumer products companies are turning to new technology to overcome the biggest obstacle to learning what shoppers really think: what the shoppers say. It turns out consumers aren't a very reliable source of information about their own preferences. Academic research has shown focus-group subjects try to please their testers and overestimate their interest in products, making it hard to get a read on what works. But getting testing right is crucial for consumer-products companies because they ship high volumes and lack direct contact with shoppers. To find out what really draws their test shoppers' attention, companies like Procter & Gamble Co., Unilever PLC and Kimberly Clark are combining three-dimensional computer simulations of product designs and store layouts with eye-tracking technology. And that, in turn, is helping them roll out new products faster and come up with designs and shelf layouts that boost sales. UFO news: Boy claims headband allows him to speak with inter-dimensional beings (click here): UFO investigator Blake Cousins recently interviewed a 12-year-old boy named Johnny Zoltkowski about a headband communication device he built. The boy built the headband from a piece of copper, a silver coin and a clear quartz crystal; he claims the device allows him to speak with inter-dimensional beings. Zoltkowski wears this contraption on his head like a tiara, and he says that he uses it to communicate with beings who live in Hollow Earth. Although the boy made the headband himself, he does not take credit for its invention. That honor goes to Billie Woodward, a man who claims he was actually born in Hollow Earth. These copper headbands are available for purchase online. They range in price from $180 to $215; the price does not include the silver coins or clear quartz crystals. Those cost extra. California legislative employees making six figures get raises (click here): At least 93 California legislative employees making more than $100,000 received raises this year, a review of newly released payroll records showed. While six-figure wage earners represent just a fraction of total legislative staff, the Capitol now has more than 300 employees making more than $100,000. Forty-seven Senate employees with six-figure salaries received raises between Jan. 31 and June 30 of this year. Six additional employees in that pay range received raises but were promoted or assigned to a new job. Records released to The Bee under the Legislative Open Records Act show that at least 189 employees in the upper house now make six figures or more, a net increase of 15 since Jan. 31. - The 2011 Federal Register has 81,247 pages. - Regulatory compliance costs dwarf corporate income taxes, and exceed individual income taxes and even pre-tax corporate profits. - Agencies issued 3,807 final rules in 2011, a 6.5 percent more than in 2010. - Of the 4,128 regulations in the works at year-end 2011, 212 were "economically significant," meaning they generally wield at least $100 million in economic impact. This, of course, doesn't take into consideration the 73,608 pages in the U.S. tax code, which has an even more direct effect on you. By the way, in 1939 there were only 504 pages. Facebook, Wal-Mart strengthen ties as Mark Zuckerberg and his inner circle visit Arkansas (click here): Facebook CEO Mark Zuckerberg is about to add the biggest retail players to his list of friends. Zuckerberg and his senior management team will spend two days at Wal-Mart Stores Bentonville, Ark., home office this week, meeting with executives of the world's largest retailer and discussing ways to "deepen" their relationship. The Facebook team will meet with Wal-Mart CEO Mike Duke and his lieutenants on Friday, in the first such meeting between the two corporations' senior management teams. Zuckerberg and Facebook Chief Operating Officer Sheryl Sandberg will then speak to hundreds of Wal-Mart employees on Saturday at the retailer's monthly meeting. Well, perhaps it was just a case of "Too Much Sunshine Syndrome." Our bright and quite warm friend, old California Sol, has been beating down quite relentlessly this week. You can only imagine the effect it must be having on some of this town's more susceptible noggins. Especially the noggins of those who often ride around town in open air vehicles. Yesterday our dear friend Kim Goddard, about as good hearted and kind a soul as you would ever want to meet, thought she would have some fun over at the Sierra Madre Patch. 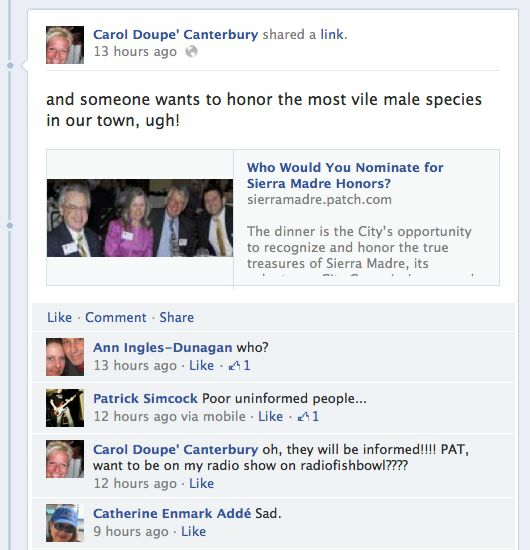 They were asking folks to nominate candidates for the Sierra Madre Honors Award, and seeing how there hadn't been a single nomination all day long, what Kim did was nominate myself. Your occasionally misunderstood Sierra Madre Tattler typer. Which is really kind of funny if you think about it. These are basically awards for people who do volunteer work for the compensated help at City Hall, and obviously I don't qualify. I do put in a lot of volunteer work here at the blog, but somehow I don't think that is quite what they are looking for. Certainly it isn't as useful to them as doing the filing. Plus there is the perception that such awards are the purview of one political persuasion in town, and very jealously guarded by people like Carol. But whatever the case, it was very much a tongue-in-cheek moment for Kim, and the people posting on this blog yesterday seemed to have fun with it. And no, I do not cha cha. Now many might think that something as harmless as this would have been accepted for its humorous intent, and people would then move on to other things. But if so, they certainly did not count on the Ragin' Realtor, Carol Canterbury, a woman who apparently takes her awards presentations quite seriously. As you can see by what I pinched from her Facebook page, Carol reacted to Kim's post on the Patch like she had been plugged straight into a wall socket. Sadly, it looks like poor Patrick Simcock has been dragged into this mess. Not only does Patrick comment indignantly on Carol's Facebook page, but he also felt compelled to do a pithy pity post on the Patch site as well. As you can see above, I have apparently been identified as the "most vile male species in town," which is saying quite a lot if you think about it. From Carol's perspective there certainly must be a lot of competition for that honor. Plus she is also threatening to take her rompin' stompin' rage onto her Radio Fishbowl Show, which I didn't even know she had. There is no "Carol Canterbury Show" listed on the Radio Fishbowl website (click here). I listen to this station, and have never heard mention of such a thing. Very odd and mysterious. But if so, it is an interesting direction for this webcast station to be going. And I do have to ask, is "Realtor Rage Radio" coming soon to Sierra Madre? Live from the desks where the phones never ring? Whenever that hour of unmediated rage in search of an intervention may eventually be airing, it should be fairly amusing. I for one can't wait to hear it. Maybe Gene Goss will talk about it on his Radio Fishbowl show today at noon. We Won, But Why Now? The Sierra Madre Crime Council?